Blog Hop Details – Blog Hop Starts at Noon on Friday, July 1! We wanted to do this blog hop to give you all a chance to show off you crafting skills. We love to meet new crafters, and to see what they create and what they love. We also wanted to have this blog hop be a way for crafters to get the word out to fellow crafters about their blog or flickr stream. We all love having new people visiting our sites and commenting on creations we are proud of, right? By participating, you will be able to get new people to discover your site and your special creations. =) We will also have blog posts on each of our blogs after the hop is over where we will showcase some of the creations in the hop that we really loved. So there will be lots of exposure possible for your blog if you join in on this fun blog hop! Our theme, Our Favorite Things was chosen to give you the opportunity to create a new project for the hop using so you can show off your skills to the blogging world. If you have a favorite company, a favorite stamp, a favorite colorscheme or a favorite crafty style, we’d love to see you create something showing that off. =) In addition to your new card or project for the blog hop, also feel free to share a favorite project of yours from the past. In other words, show us what you’ve got! Well, there are so many ways in which you can be or feel young. It’s not only about age but often more about how you feel! Maybe coloring stamped images makes you feel like a kid playing with crayons again. Maybe you’re new in the crafting world and are learning about crafting like a child learns about the world. Maybe you like creating projects for children or using fun images that would suit both children and light-hearted adults alike? 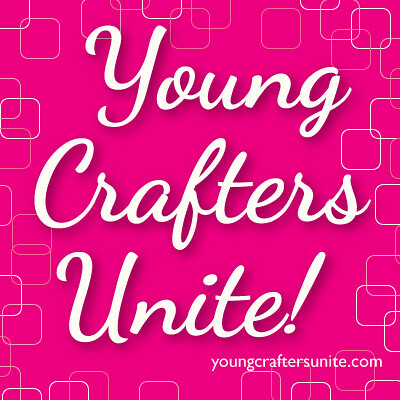 However you may feel young, in your crafting or in your everyday life, we would love for you to join in on this blog hop! If you sign up to be a participating blogger, make sure to watch for an email with more information about the blog hop. The email will tell you all you need to know about what to post for the blog hop, when to post it and any other important information. Should you have any other questions though, please send them in an email to one of us. Britta’s email is: britta.swiderski@gmail.com and Marie’s email is: legojenta@hotmail.com. Also, we wanted to let you know that there will be prizes to be won in this blog hop! The amazing Simon Says Stamp, DeNami Design, Paper Smooches Stamps have graciously offered to sponsor the hop and have donated gift certificates and/or product to give away! ← Blog hop sign up! Its fun to be part of the Hop. Thanks for organizing it Britta and Marie. HORRAY FOR AN AWESOME BLOG HOP!!!! You all rocked! It’s a shame you don’t have a donate button! I’d without a doubt donate to this brilliant blog! I guess for now i’ll settle for bookmarking and adding your RSS feed to my Google account. Find out more by shopping on the web at your leisure and in order to compare and contrast the different prices. Human beings would have a greater chance at a longer lifespan if the world’s air and water were cleaner and free of chemicals. and found that it’s really informative. I am gonna watch out for brussels. I will appreciate if you continue this in future. Many people will be benefited from your writing. Cheers!